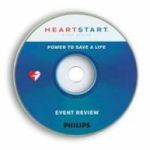 The Philips FRx Defibrillator features technological advancements to help in treating the most common cause of SCA. ItÃ¢â‚¬â„¢s designed to be easy to set up and use, as well as rugged and reliable for those who get there first. 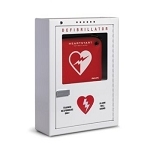 On the scene with law enforcement, on the field with student athletes or on the job with employees, the FRx Defibrillator is the solution for treating SCA in environments and conditions too demanding for other defibrillators. 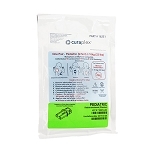 Simply insert the Infant/Child key into the FRx to signal to the device that youÃ¢â‚¬â„¢re treating an infant or a child. 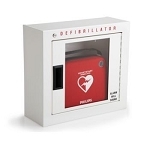 The defibrillator adjusts to provide special pads placement and CPR instructions. 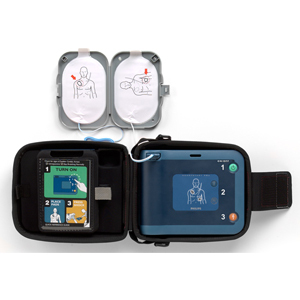 The pads icons also flash to show you the optimized pads placement, and the device reduces the shock energy to a level more appropriate for an infant or a child. 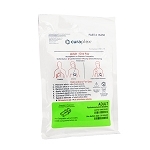 Clean design and clear voice instructions, including CPR coaching, are designed to help instill the confidence thatÃ¢â‚¬â„¢s needed when treating a person in cardiac arrest. Infrared data port for easy transmission to a Smartphone or PC running Event Review software, without cables or hardwire compatibility issues. 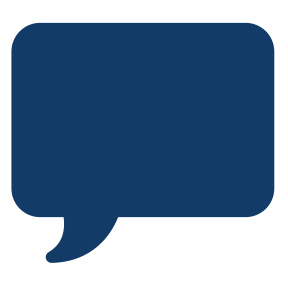 SMART Analysis automatically assesses the victimÃ¢â‚¬â„¢s heart rhythm and is designed not to deliver therapy unless the rhythm is determined to be shockable Ã¢â‚¬â€œ even if the Shock button is pressed. And with patented Quick Shock, the FRx is among the fastest in class at delivering a shock after CPR. 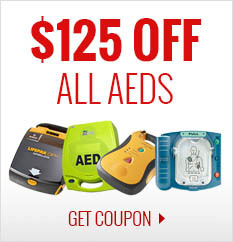 Studies show that minimizing time to shock after CPR may improve survival. As American Heart Association Guidelines 2005 note, Ã¢â‚¬Å“Reduction in the interval from compression to shock delivery by even a few seconds can increase the probability of shock success."